Fired Housing Development Corporation (HDC) Managing Director Jearlean John yesterday filed nomination papers to contest the post of UNC political leader in the party’s November 26 internal election. 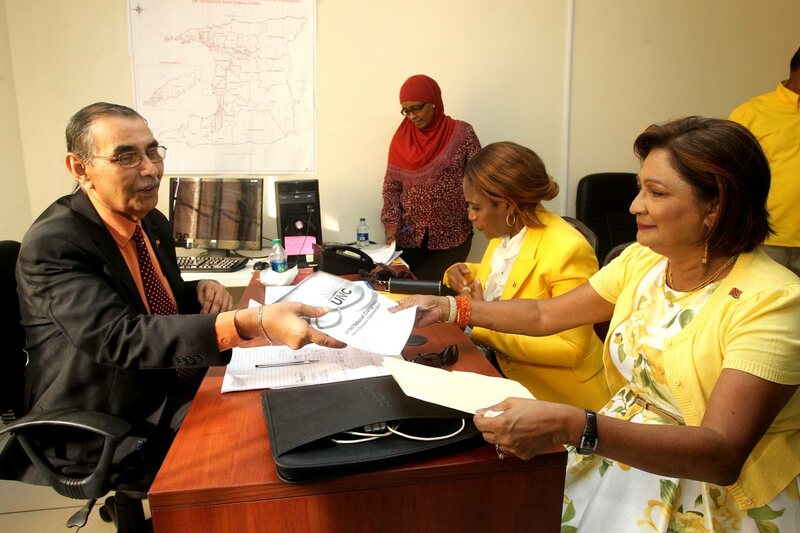 At first it was thought John, who was Transport Minister during the Basdeo Panday administration, was merely supporting UNC political leader Kamla Persad-Bissessar by walking with her as she (Persad-Bissessar) entered the party’s Couva headquarters to file nomination papers shortly after 3pm. However, John presented her own nomination papers to the party’s election officer Dr Rampersad Parasram. Both women, dressed in the party’s bright yellow colours were greeted by an entourage of supporters waving flags and dancing to the beat of tassa drums. “I am a citizen of this country and we believe in democracy,” John said. “I believe there is a time when you put up your hand to serve. I am going to step into this ring and make a further contribution.” She said she was elated to be selected by Persad-Bissessar for the position. In her former position as HDC managing director, John served different prime ministers in varying capacities. She told reporters she is well acquainted with Persad-Bissessar. John was sent on administrative leave on December 17, 2015. The board requested a meeting with her on March 21, 2016. Subsequent to that meeting, John was axed as managing director. She has since sued the Government for $17 million. Reply to "JEARLEAN FOR DEPUTY"